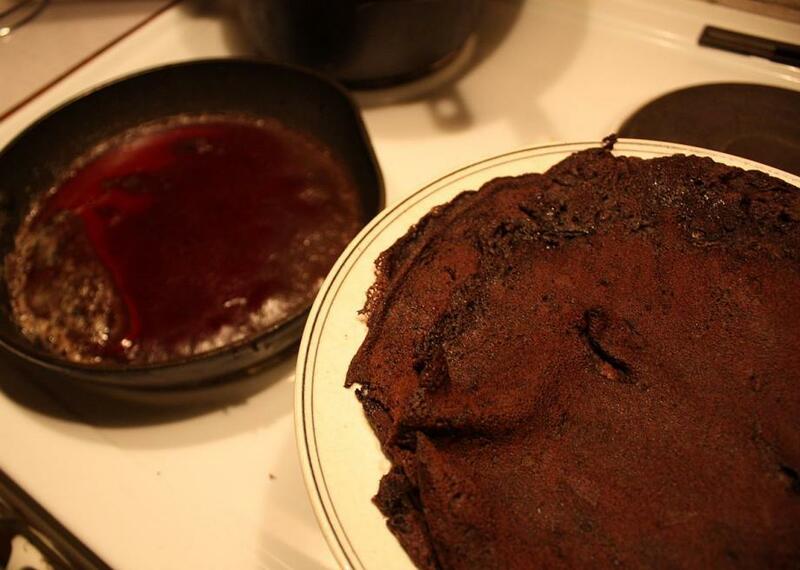 Blood pancakes are exactly what they sound like: a flapjack made with blood. The traditional dish, known asveriohukainen in Finnish and blodplattar in Swedish, is exactly what it sounds like: a flapjack made with a healthy helping of blood. Such pancakes originate from more of a utilitarian background than from a Twilight message board. Today, blood from the butchering process, at least in most large slaughterhouses, is treated as a waste product, or used in fertilizer, fish food, and even cigarette filters. But blood can be as hearty, and usable, part of an animal as many of the meatier parts. Blood can be found in a number of traditional recipes, most famously in European blood sausage and black pudding. There are also lesser-known dishes such as Germany’s schwarzsauer, a soup made of blood, spices, and vinegar, or China’s blood tofu, which is just blood that has been allowed to congeal into a soft consistency. If the sight of a deep cut is the type of thing that can make you pass out, then blood foods probably aren’t for you. But if you can stomach the idea of eating cooked blood, it’s actually quite healthy. Like eggs, blood is high in protein, making it a simple source of the nutrient. In addition, blood is extremely high in iron, which can help stave off anemia (although it also gives it that metallic aftertaste). In addition to its health benefits, blood makes an excellent replacement for eggs in cooking, acting as a binding agent, and easily whipping up into a dense foam. Perfect for things like pancakes! Blood pancakes seem to have originated from Finland and spread across Scandinavia, especially to Sweden. There are a number of variations on the recipe, but the core ingredients are generally the same: milk, flour, sometimes even an egg, and blood. Usually the preferred blood used in the recipe is pig’s blood (available from the butcher), but people have also used their own blood, and more specifically, menstrual blood. On their own, blood pancakes end up being a savory dish, so many recipes call for enhancing the natural flavor by adding things like onions, spices, bread crumbs, and molasses. The only other body-fluid-specific requirement is to strain the blood to remove any clots that may have formed. Which really hammers home that you’re cooking with blood, in case you forgot. Once the batter is prepared, the pancakes can be cooked just like any other flapjack. No matter the color of the batter, the cakes usually take on a dark, nearly black color as the blood cooks. They are often described as a bit denser than your standard fluffy pancakes and definitely retain the metallic tinge that often turns people away from blood-based foods. The pancakes are often served with lingonberries, or lingonberry jam, which can help cut the coppery flavor. Or, as the Nordic Food Lab suggests, you can add rye sourdough starter to the mix, which also helps hide the taste of blood. While consumption of blood-based foods is not as popular as it once was, blood pancakes are still a fairly common dish in Finland and Sweden. There are brands that sell sleeves of already-cooked blood pancakes—a sanguine alternative to Eggo waffles.